Farm to School Round Up - 9am-4:30pm, $25 per person. This full-day workshop includes intensive Farm to School training focused on what producers need to know to scale up and be ready to sell to schools. Presenters include Farm to School specialists from TDA, SFC, and TOFGA as well as information from producers and other organizations. For more information about the agenda for the workshop. Whole Farm Revenue Protection: How It Works for Diversified Farms - 9am-12pm, $15 per person. Whole Farm Revenue Protection (WFRP) is the new crop insurance option that actually works for diversified growers of all kinds. This session will look at Whole Farm Revenue Protection in detail - its strengths, weaknesses, and requirements. General information about crop insurance is also included for those who haven’t had previous experience with it. HMI's Open Gate at Honey’s Acres Farm - all-day, $50 per person (includes lunch). Holistic Management International hosts an all-day “Open Gate” event. Open Gates are peer-to-peer learning days with short presentations and small group exercises led by experienced facilitators and producers. Whether you are a producer or simply interested in healthy food, sheep, goats, and/or grass-fed cattle, this is a day for you! Eden's Organic Garden Center & CSA Farm, Balch Springs, TX - Farm Tour from 1-3 pm, $15 per person. Marie Tedei is founder/owner/farmer of Eden’s Garden CSA Farm, using organic and non-synthetic fertilizers and pest control methods to grow seasonal vegetables, perennials and newly installed fruit bearing trees. In production only since 2008, Marie works to create multiple "profit-centers" including a part-time garden shop and on-farm mini-market, to help stabilize the cash-flow throughout the year, and during slow seasons. She will talk about the farm’s history, its inception and transition from horse boarding facility to what it is today and her plans for it down the road. It’s a good long walk so be sure to wear appropriate foot attire and dress for the weather. 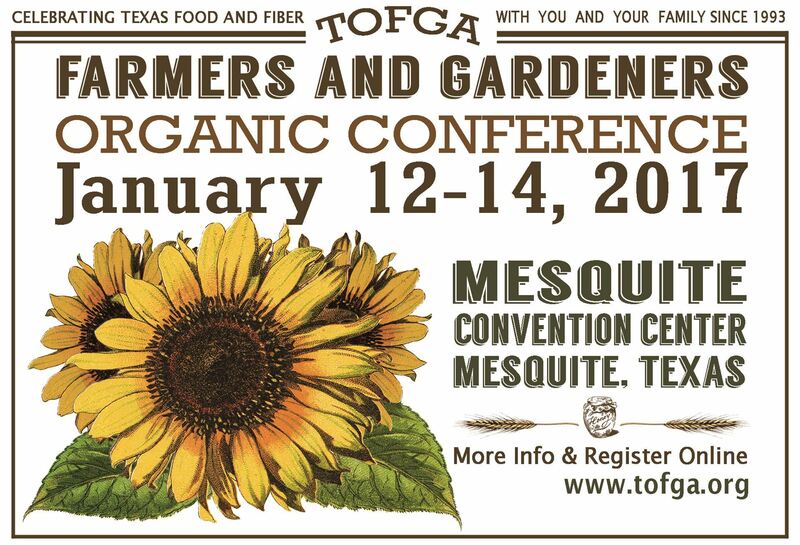 The farm is located less than 10 minutes south of the conference center, just about a block north of the I-20 freeway. Burgundy Pasture Beef, Grandview, TX - Market & Ranch Tour from 10 am - 12 noon, $15 per person. Join Jon and Wendy Taggert for a tour of their 100% grass-fed cattle ranch. The tour begins at the Burgundy Boucherie Store & Butcher Market at 800 McDuff Ave. in Grandview. Everyone will caravan from the store out to the ranch, a distance of about 3 miles. The Taggerts have been raising exclusively 100% grass-fed beef on this ranch since 1999. It had previously been row crops, but they have returned the 900 acres back to native grassland. Some important research projects are going on at the ranch about changes to the soil, the wildlife, etc. Those interested in truly sustainable systems will be very interested to attend. To register for a pre-conference workshop and the TOFGA conference, for the registration page and follow the form. The pre-conference workshop will be a selection to add onto your conference registration. To register for only the pre-conference workshop **You will need to select the "Pre-conference workshops Only" option which is down toward the bottom of the registration types. The workshop you want will be an option in the list of pre-conference workshops, be sure to select the correct option as you move through the form.